Chiropractic offers a balanced approach to the treatment and the healing of sports injuries. Fitness Inspired offering exercise classes! Located next door at our Wellness Center! Chiropractic keeps you functioning, moving and enjoying life to it's fullest at all ages! Acupuncturist Dr. Jessica Stevens is now scheduling appointments! Wellness in Motion is a mind body movement yoga studio located next door in our Wellness Center. Specific exercises will be prescribed for your condition to help you return to optimum health! Deep Tissue Massage will noticeably loosen muscles, alleviate pain, and increase mobility. Stenosis successfully treated with conservative care! Does your lower back pain get worse after walking short distances? Does sitting reduce your lower back pain symptoms? Do you walk better when you have something to lean on? you would benefit from the LSS Treatment! Studies at Mount Sinai Hospital in Toronto and at the University of Pittsburgh have shown that this treatment has improved walking distances and reduced low back pain in people with lumbar spinal stenosis for one year after treatment. The participants from these studies have regained their independence and ability to walk further with less low back pain. exercises shown by Dr. Carlo Ammendolia. Call us at (814) 234-5271 today. Nittany Valley Chiropractic Center provides comprehensive chiropractic treatment, which includes manipulation of the spine and extremities, therapies, specific exercise prescription, rehab therapy, and nutritional advice to patients in the Centre Region of PA. Our four doctors, Dr. Roy Love, Dr. Shawn Sebora, Dr. Kayla Wagoner and Dr. Jay Wagoner share over 54 years of experience. We are proud to offer state of the art care for your health problem and pledge to return you to better health and function as quickly as possible. We have two offices, one in State College and one in Spring Mills. 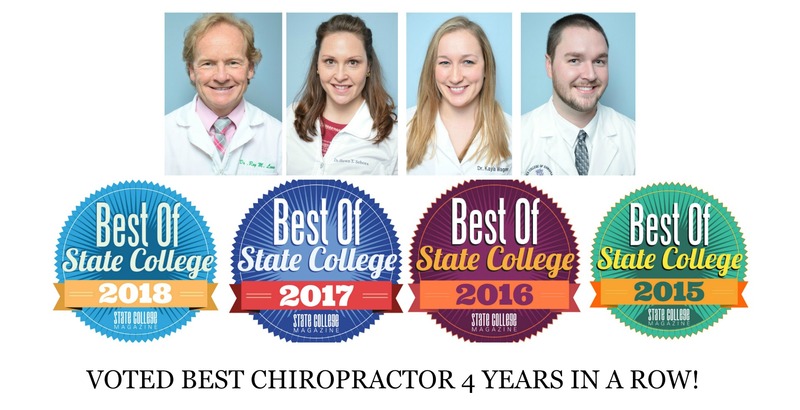 With the use of advanced sports injury treatments, rehab techniques, massage and chiropractic treatment we are proud of our excellent outcomes and a quick return to health for our patients. Over time, we’ve built a loyal large patient base providing excellent customer service and individualized treatment to each person who we welcome into our offices. Please take some time and review our website and the information about chiropractic and health. We will update our site providing information to help you determine if our office is where you need to make an appointment and continuously provide information to help you stay well after you have become one of our patients. If you are suffering from a health concern please call our office and we will gladly set up an appointment for a consultation and exam to see if we can help. If we feel we can not help we will refer you to another provider who will be able to help. That is our guarantee to you. If you are new to seeing a chiropractor and want to find out more, please email us or call (814) 234-5271 to receive personalized answers to your questions from our friendly team. We also welcome referrals, so we invite you to share our chiropractic and wellness information with your friends and loved ones. My love of farms, old barns and the beautiful rolling countryside of central Pennsylvania is the inspiration behind my paintings. I strive for realism in my painting. I work in my studio from photos I've taken of rural central Pennsylvania. Barb Pennypacker was a faculty member in Penn State's College of Agricultural Sciences. A traumatic brain injury, from a collision with a coal train, took her analytical ability, which ended her research career. She held the rank of Professor of Agronomy and Assistant Dean of the Graduate School when she retired in 2005. She soon realized that the old barns she loved were rapidly disappearing. Barb had a strong desire to pain these barns before they were gone forever. She took a private, month long, drawing class. The studio was an abandoned farm with a crumbling barn. She spent the next year plein air sketching old barns. Classes at the Art Alliance of Central PA and subsequent painting partners took her from sketching to watercolor to the oils she now uses. Barb's paintings are featured in the Bellefonte Art Museum book "Landscapes of Central Pennsylvania" and have been in numerous juried shows. 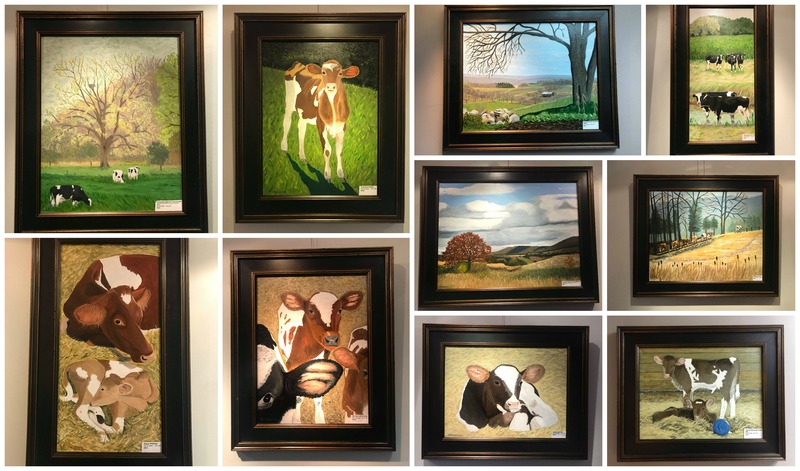 She is a member of the Farmland Preservation Artists, the Art Alliance and the Bellefonte Art Museum's Artist Registry. She is curator of the Print Gallery and a member of the Advisory Board at the Bellefonte Art Museum. 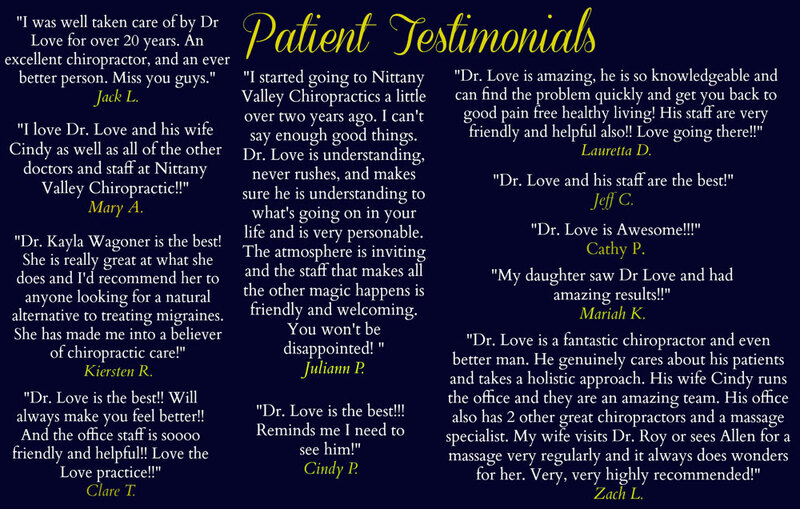 We greatly appreciate you as a patient and hope you tell your friends and family of your experience at Nittany Valley Chiropractic. In this new and changing world of healthcare your referrals to our office are the greatest compliment you can give us for helping you return to health. As a simple thank you we have produced this certificate which you can print out and give to a friend who is considering coming to our office. Please print your name on the bottom of the certificate. If your friend, colleague, or family member presents the certificate upon being seen at our office you will be credited $20. A simple thank you for helping us help others. 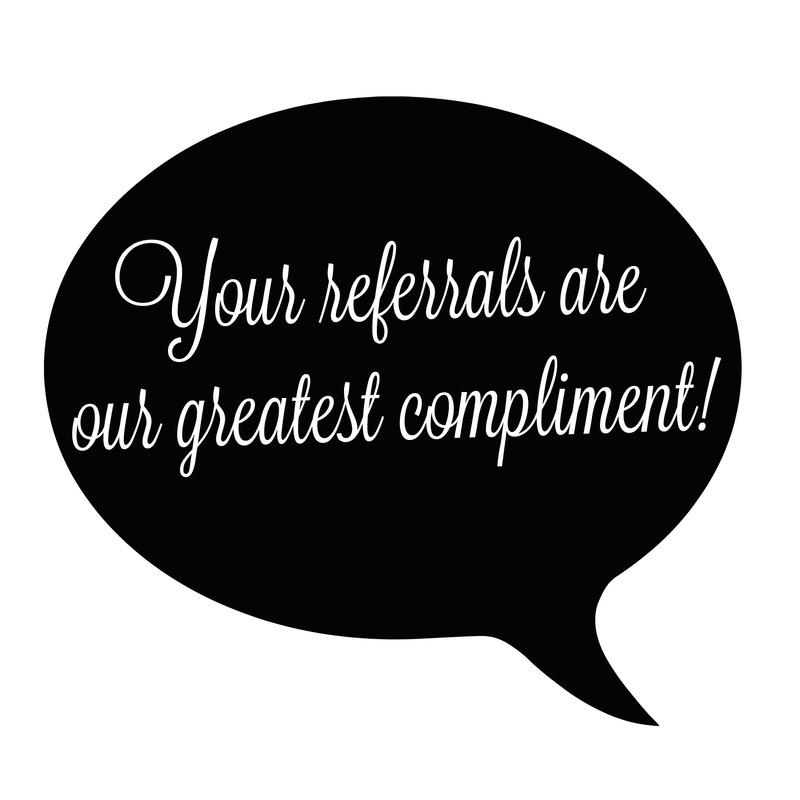 Thank you for your referrals!